We offer a variety of pergolas, arbors, and gazebos to help you add more beauty to your property. Our customer wanted to update their space, and this pergola gave them the perfect shady spot to rest poolside. The nearby fireplace also gives allows them to use the space for warm gatherings in the fall. 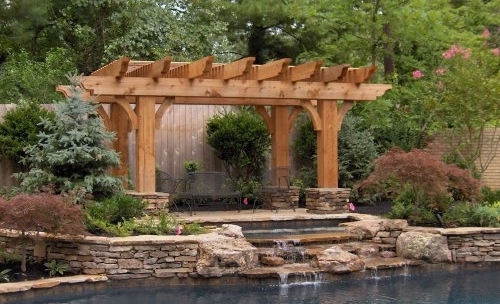 This pergola gave visitors a place to enjoy the beautiful gardens, stonework, and water with this open top design. This free-standing pergola was built on a triangular pad to create a little oasis for the customer to sit and enjoy their backyard. This pergola was build on a seamless concrete pad and makes a great sitting area for visitors. Built near the end of a pool, this pergola gave the customer a nice area to cook, visit, and enjoy some company.